SHOWS LIKE A MODEL! Why wait and go through the building processing? EVERYTHING is done. The EXTRAS have been picked out. 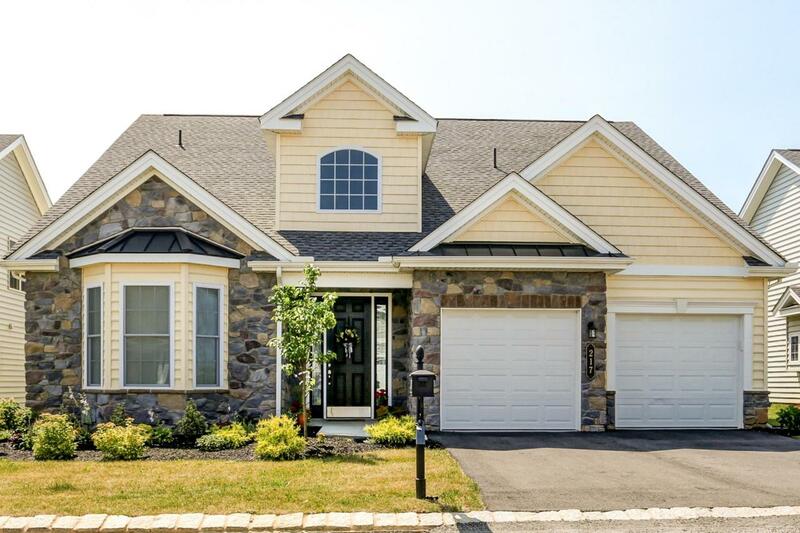 Just move right into this FRANKLIN 2-story model in Traditions of America @ Silver Spring! 3 bedroom, 3 full baths! $11,000 in upgrade to the fa~ade in extra stone & 8' painted solid oak door (1 ft higher than a traditional door). As soon as you enter the grand entry, there is Amendoim hardwood floors ($20k upgrade) everywhere and the feel of open space from the vaulted ceilings. 1st floor master suite with upgraded trim/tray ceilings with rope lighting, & upgraded walk in tiled shower with frameless door. Living room can be used as a 1st floor office. 2nd bedroom also on first floor with full bath access. Open dining area (with more hardwood floors) overlooks spacious family room with vaulted ceilings. BEAUTIFUL painted maple kitchen with Zodiaq solid surface counters & custom backsplash. Breakfast bar, stainless steel appliances, Microwave vented to exterior, huge pantry, gas cooking, under cabinet lighting, and Breakfast nook with patio doors to oversized patio. 2nd floor open loft overlooks foyer & family room. 3rd bedroom with private full bath. Additional storage room on 2nd floor (6x10 room). Additional features include tankless hot water heater, Culligan water softener, finished drywall & painted floors in garage, Traditions of America is a 55+ community focusing on maintenance free living and a social lifestyle with access to the clubhouse, fitness center, walking trail, & indoor/outdoor pool for those who want to take advantage. Exclusions Refrigerator Washer/Dryer Window Treatment in 1st Floor 2nd Bedroom.